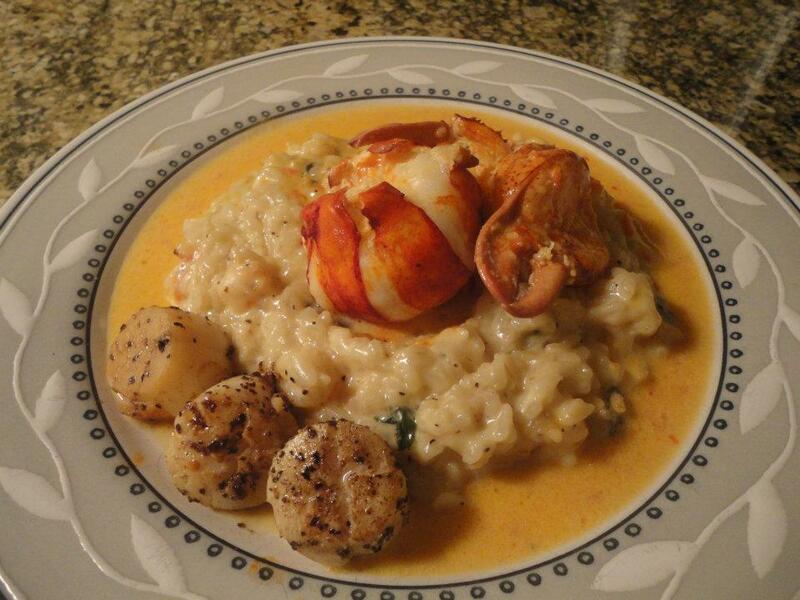 Shrimp Risotto, poached lobster & seared scallops with a tomato butter sauce… Requested by Danielle P! So I got a request this morning from one of my Facebook friends looking for some ideas for risotto. Immediately my mind went back to this dish that I had made some time back for my wife and myself… I pitched it to her and she liked the idea, so here it is. Alright, so there are a handful of different steps here, but it’s not tooooooo difficult. Some proficiency in the kitchen will help though… It’s really more about time management and accurately judging how long your risotto needs. First thing’s first, get water boiling in a very large sauce pot for your lobsters. (Note: If you don’t have a very large sauce pot you could always cut the tails and claws from the live lobsters and solely boil those instead of the whole bodies.) Also set up an ice bath, i.e. a large tub (or even your sink) with a combination of ice and cold water. You’ll need this to halt the cooking process on the lobster after par boiling. Put your lobsters (or lobster pieces) in the pot and boil for 3 minutes. This will not cook the lobsters through, but it will cook the outside of the meat enough that you will be able to remove it from the shell. Remove the lobsters from the boiling water and immediately submerge in the ice bath. All to rest for 5 minutes so the lobster is cooled entirely. Once cooled remove the tail and claw meat from the shells, clean, and set aside in the refrigerator. I also do my best to get out any knuckle meat and use that in the risotto. Next let’s work on the sauce. Melt 2tbsp (the remaining 6tbsp will be needed for the sauce later) in a medium sauce pot at medium-high heat, add your chopped garlic and lightly brown. Once the garlic is browned add your chopped plum tomato, salt, and ground black pepper. Cook the tomatoes until they begin to sweat, roughly 4 minutes. Increase the heat to high then add your white wine. Reduce the wine by half, then add your chicken stock, light cream and 6tbsp on butter, stirring the ingredients together. Bring the sauce to a boil then reduce the heat to low and allow to lightly simmer, stirring periodically. So, now it’s time to start on the risotto. Read this paragraph very carefully… The KEY to good risotto is to cook it SLOWLY, stir it VERY REGULARLY, and to KEEP IT WET. (Note: Do not use the risotto shown in the photo above as a reference. That particular day I was in the mood for a richer, creamier rice , so I added a touch of heavy cream, which is not true risotto. The end product here should not look like that. Your final product should be slightly firm but moderately loose and naturally creamy, but not sticky, and when you put it on a plate or bowl you should be able to actually shift the risotto simply by moving the plate.) One other key to making good risotto, DO NOT SUBSTITUTE THE CHICKEN STOCK WITH WATER!!!! Stock adds flavor and richness, if you use water you’re just boiling rice. That is risotto blasphemy and I may never be able to talk to you again. Bring a medium sauce pot to high heat and add your dry Arborio rice and heat, stirring constantly, to just slightly toast the rice. Add your white wine and allow to reduce by half, stirring regularly. Ladle some of your hot stock into the risotto and reduce heat to medium-low. Add your salt, pepper and garlic powder. As I stated above, you have to really stay on top of risotto and stir it very regularly. As the liquids cook down you’ll need to ladle more into the pot and keep stirring. By the time the risotto is done you will have very likely used all of the 4 cups of warm stock. Risotto is a labor of love. Low heat, stirring, adding stock, stirring, adding stock… for upwards of 40-45 minutes, or longer. Once you pass the 25 minute mark you’ll need to start periodically tasting your risotto for texture, to determine it’s doneness. It should be soft, but with the slightest firmness to it (not quite crunch) and have a slight creaminess. Once you’ve been cooking the risotto for about 20 minutes it’s time to start working on your scallops. Salt and pepper your scallops. Bring a sautee pan to high heat and melt your butter. Add your scallops. You’ll want to sear them until they get a nice brown caramelization, roughly 4-5 minutes, then flip and repeat. Add your chicken stock to the sautee pan to deglaze, cooking for an additional 1 minute. Remove the scallops from the sautee pan and put in a baking pan and pour the liquid from the sautee pan over them. Allow them to rest at room temperature until we’re ready for them again. Have you been stirring your risotto and adding stock? Next, time to puree the sauce. Using a blender, food processor or hand emulsifier liquefy the sauce, removing all tomato and garlic chunks. Straining should not be necessary. Put the sauce back in the pot and put back on low heat. Grab your lobster out of the fridge. Cut the tails in half longways to make four pieces. Add your tails and claws to the tomato butter sauce, and increase heat to medium, stirring periodically. Now add your chopped shrimp and 2tbsp of butter to the risotto… continue stirring regularly. Put your seared scallops in the oven, cook for 10 minutes, this will give you nice medium scallops. When the scallops have been in the oven for 5 minutes stir the chopped basil and grated parmesan into the risotto. Give it a taste to check doneness as well as seasoning. Once the 10 minutes for the scallops is up your risotto should also be done, time to get plating. The way I like to do it what is shown in the photo above. I set my risotto in the middle of the plate, top it with a piece of lobster tail and one claw, ladle some sauce around the edges and then place the scallops to the side. But hey, to each their own, if you have a different idea, go for it! So that’s my recipe (thank Danielle for asking for it… assuming you like it), and those are my pairings, and that’s my story. 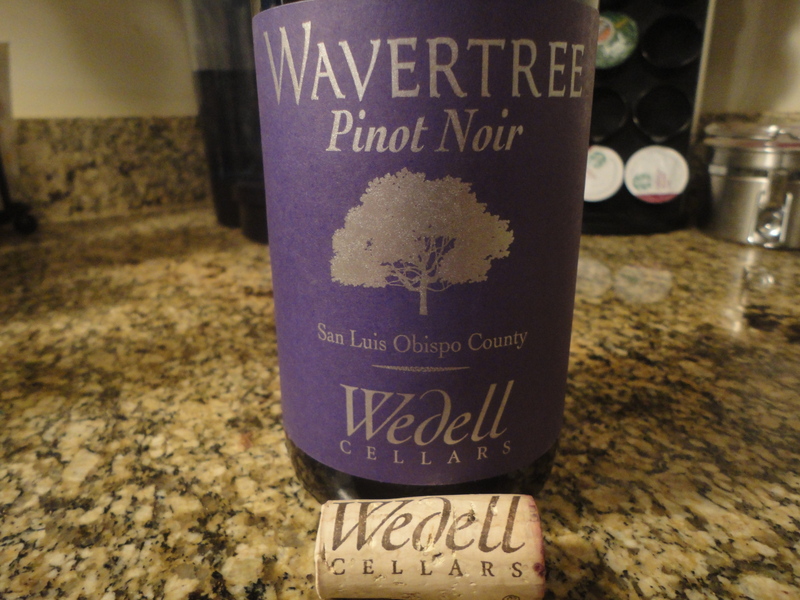 I hope you’ve enjoyed the read, and I hope you try the recipe, or the wines, or both! New posts coming within the next few days, but in the meantime go to the store, grab a bottle of something you’ve never had before, and expand your mind! Life is short, enjoy it! Tags: four bears, peirson meyer, poached lobster, risotto, san luis obispo, sean minor, seared scallops, shrimp risotto, tomato butter sauce. Bookmark the permalink. Previous post ← Everybody has their own chili recipe… here’s mine! The shrimp risotto, lobster and the bread sound wonderful. I’ m looking forward to trying them. Your Mom told me about the recipes and what a good cook you are.